RCN student committee member Georgina Ledwith explains how attending a meeting of the European Nursing Student Association in Belgium helped her learn more about nurse education across Europe, and why students should work together to overcome challenges and effect change. of the European Nursing Student Association. I represented UK nursing students at the annual general meeting of the European Nursing Student Association (ENSA) in Brussels in October. 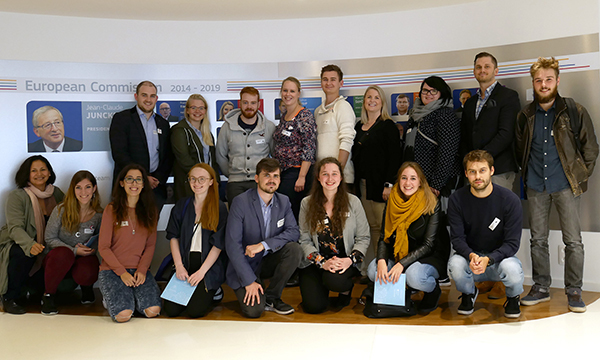 Founded in 2014 with the help of the European Nursing Federation, ENSA brings together nursing students from across Europe to create a network between national nursing student organisations. It is a forum for students to look at the differences and similarities in nurse education across Europe, discuss the practical and theoretical aspects of training, give and receive advice, and help each other understand the world of nursing. As well as the UK, the countries represented at the AGM were Germany, France, Belgium, Finland, Ireland, Switzerland, Iceland, Norway, the Netherlands and Spain. As the London member of the RCN student committee, I act as an advocate for nursing students in the capital. But attending the ENSA meeting enabled me to see the ‘bigger picture’ of nurse education across Europe, and I was particularly interested to learn more about what nurse training looks like in other European countries. In Ireland, for example, a nursing degree takes four years compared to three in the UK, and the practical skills students are taught also differ across Europe, with students training in Spain learning how to cannulate. It was clear from the meeting that European students face similar challenges, such as placement support and finding a work-life balance. The three main areas discussed were EU directive 2013/55, which provides a standard for nursing across Europe, mobility programmes in nursing such as Erasmus, and the empowerment of nursing students. The RCN is keen to empower students by investing in them and providing learning opportunities, and it was great to talk about the work they do with student information officers, a network of RCN students who work closely with the college to support and share information with fellow students. Part of the visit involved a trip to the European Commission, where we learned about universal health coverage, personalised medicine and health inequalities. This was particularly beneficial as I was not fully aware of the role of the European Union in relation to nursing. The overall theme was the importance of co-operation, and how we must face the healthcare challenges across Europe together. Meeting students from across Europe was an opportunity to network and share ideas, and I would encourage all nursing students to learn about the work of ENSA.